Montserrat Breezes on kauniisti viisi makuuhuonetta, viisi ja puoli kylpy yksityinen huvila sijaitsee korkealla Woodlands osassa Montserrat. Rakkaudella ja huolella rakennettu yksi Amerikan rikkain ja päivitetty sen nykyiset omistajat, Montserrat Breezes sijaitsee yli 6000 neliöjalkaa sisällä ja ulkona asuintilojen, henkeäsalpaavat näkymät (etenkin auringonlaskun) Karibianmerelle lähes kaikissa asuintiloissa. Kolme kuningas sviittiä (kaikki king size-vuoteet) on tilavat huoneet, joissa on istutus ikkunaluukut, kylpyhuone kylpyjä ja verannoilta. Kaksi alempi sviiteissä yksi kuningas makuuhuone ja vieressä hengen makuuhuone. Molemmat makuuhuoneet tarjoavat avoin merinäköala, kylpyhuone kylpyjä, ja yhteinen katettu veranta. Ovi näiden makuuhuonetta voidaan lukita yksityisyyden tai avata lapsiperheille. Tämä huvila on suunniteltu maksimoimaan merinäköala kaikissa huoneissa on suuri "katoamassa" lasi ja näyttö paneelit jokaisessa huoneessa. Lisäksi, ulkona ruokailu-ja perhehuoneita on suuret istutus ikkunaluukut takaseinälle, joka avaa katsella yksityinen piha ja hoidetut puutarha. Perusteet ovat porrastettu kiviseinät ja on laajasti maisemoitu useita lajikkeita palmuja, kukkivia puita ja pensaita. Alempi Pihassa banaanit, sitruunat, guava, kookospähkinöitä ja greippi (kun kausi). Lapset nauttivat erilaisia ​​liskoja, konnat, ja lintuja löytyy ja ympäri omaisuutta. Tuo taskulamput - konnat tulevat ulos yöllä. Montserrat Breezes helposti mahtuu suurperhe, kaksi pientä perheille tai enintään viisi pariskunnille. Alempi täydellinen keittiö on täydellinen allasravintola tai viihdyttävä. Tämä huvila jäähdytetään lähes jatkuva kaupan tuulet ja sijaitsee vastapäätä sisäänkäynnin kuuluisa Mountain Trails Montserrat. Se sopii retkeilijöille ja luonnon ystäville. *** Tämä Villa ei sovi pikkulapsille tai nuoria, jotka eivät voi uida tai olisi taipuvainen työntää lattiasta kattoon näytön paneelit. Vuokralaiset täysin vastuussa allas turvallisuus. Toinen täysi keittiö alemmalla tasolla lähellä uima-allas. Exceptional property with spacious well planned out rooms with pool. A beautiful property with spacious well planned rooms with en-suites and beautiful well maintained pool with the individual in mind. The property is exceptional, well maintained by Anita and Pickett who I commend for their excellent customer service and care and attention to detail. I would also like to say a big thank to Mike the owner of Breezes for his excellent customer service and prompt responses to my emails. The property was amazing! Everything you could possibly need was provided. It is very clean and spacious. Mike, the owner, was very helpful with information before the holiday and arranging for us to be picked up from the airport on arrival. I would definitely recommend both Montserrat, the island, and Montserrat Breezes for a place to stay; we will be back. Now I am back in the UK I am missing the sound of the tree frogs at night “singing” me to sleep. Let me first start of by saying Montserrat Breezes is simply amazing. My girlfriend (who is native Montserratian)and I come annually to the Island and have stayed at different villas over the years and Montserrat Breezes has to be our new favorite.Breezes has everything you could possibly want,the views of the sea are spectacular,a great view of Redonda and on clear days you can see Nevis and watch the sailboats and cruise ships pass by. Watching the sunsets from the large covered porch is amazing ,it never gets old watching the sun seemingly disapear into the sea while sipping on your favorite beverage.There are the Duberry Cassava hiking trails in walking distance from the villa and Woodlands beach, a nice sandy bottom beach with picnic area a long walk or short drive down the street. The grocery store and places to eat are also close. The villa is spacious and well kept with plenty of bedrooms and bathrooms if you are a larger party but also cozy and private for couples. Everything you could possibly need is in the villa from linings to cooking utensils,wifi and cable tv. Mike has thought of it all. The layout of the villa is nice,large bedrooms with bathrooms at each end on the upper and lower floors with very comfortable beds and covered porches overlooking the pool and tropical landscaping with fantastic views of the sea and sunsets. A large gathering room elegantly decorated on the upper level with full views to the outside due to the full length sliding doors. Walking around the villa grounds looking at all of the flowering plants , fruit trees and wildlife can keep you occupied for hours.On one afternoon I was entertained simply sitting on a large rock out front and watching the Iguanas and ground lizards come within feet of me to eat and bask in the sun. All of the people who care for the villa are friendly and helpful from Anita the maid to the pool guy and of course Pickett who picked us up at the airport,assisted with getting driver license and rented us a car. When leaving the Island early in the morning we needed a ride to the airport and Pickett told us to take the rental car and he would pick it up later at the airport which made things easy for us. Thank you Mike for sharing your wonderful villa with us we would surely stay here again the next time we visit the Emerald Isle. Spectacular Villa, extremely well managed and run! 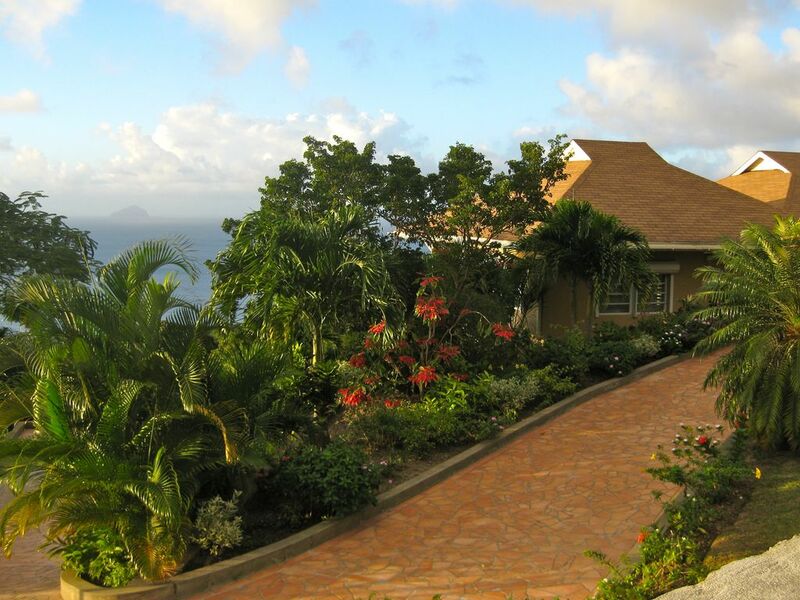 Montserrat breezes is an exceptional villa. The views were even more stunning than the pictures we saw before our trip. We were a family of seven, our Mom was born on the island in 1937 and emigrated to Canada when she was only 8 years old. She had never returned. The trip was a 80 th birthday present and family reunion of sorts. Without a doubt the best vacation we have had to date. The villa is simply gorgeous. Mike was amazing both before during and after the trip. Attentive, patient, informative and an all round true professional. Pickett was really nice and professional (we rented a car from him, and our tire was looking like it needed air and this wonderful man was willing to come deal with it late one night even though he was not feeing well... and I had only called to ask him how best to deal with it the next day..amazing service...of course we told him we could wait till the next day and he was there before any of us had woken up). Anita was efficient and a very lovely lady. The villa was clean and everything worked, the grounds were immaculate. I am positively sure that I will return to the island and I am just as sure that I would want to stay at Montserrat Breezes. Absolutely fantastic place and service. Thank you Larry and Debbie. I am very happy that everyone enjoyed their stay at Breezes. I plan to bring a pair of binoculars in September for guests to enjoy and hopefully see some whales too. Best Wishes. Beautiful, comfortable, and exceptional villa with amazing views and grounds. This was our second time to visit Montserrat and while we love exploring the island this villa is really hard to leave. Tons of covered patio space with fantastic views, right next to the trails into the Centre Hills, a large deep pool, and exceptional manicured grounds with a great variety of flowering plants, lime trees, avocado trees, and even star fruit. Montserrat is not for everyone but for those that get it this villa is perfect. The owner was great as was everyone else. His property manager, Pickett, met us at the airport and we were able to rent a car from him at a very reasonable rate. He even brought us ripe avocados on our first morning there, so good. If you are visiting Montserrat with a larger group and need a few bedrooms this is the place to stay and a fantastic value. Tämä Villa sijaitsee lähellä sisäänkäynnin kuuluisa retkeilyreitit Montserrat, mutta on panoraama (Auringonlasku) näkymät Karibianmerelle. Rates quoted are for the use of 1 bedroom for 1 week for up to 2 guests. Additional guest rates are based upon 2 guests per bedroom. If paying by credit card, please add 2.5% convenience fee.